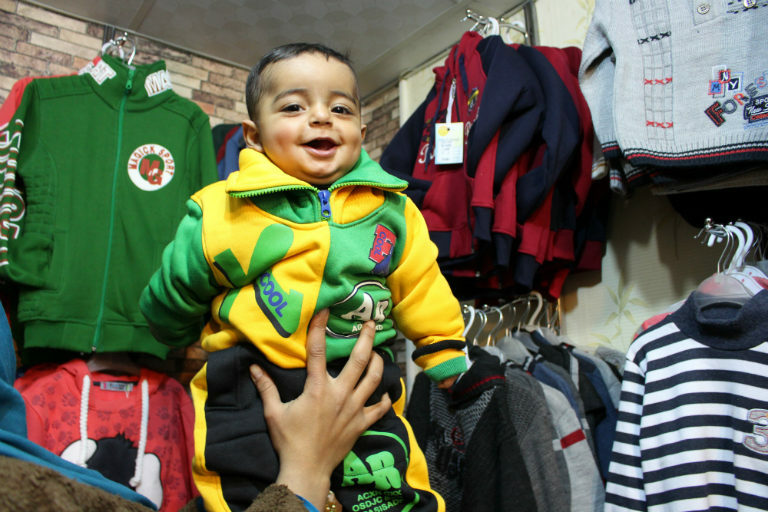 Winter clothing e-vouchers are providing warmth and dignity for Syrian children, while also supporting the local economy. Winters in Syria are harsh and for children displaced from their homes it can be a struggle to survive. Children across Syria are living in homes without proper insulation or adequate heating. Their families cannot afford basic supplies like winter clothes. Last winter UNICEF launched an e-voucher initiative to provide 57,000 internally displaced children in Syria with a full set of winter clothes. Photo: Zeinah, Syria, 2017. 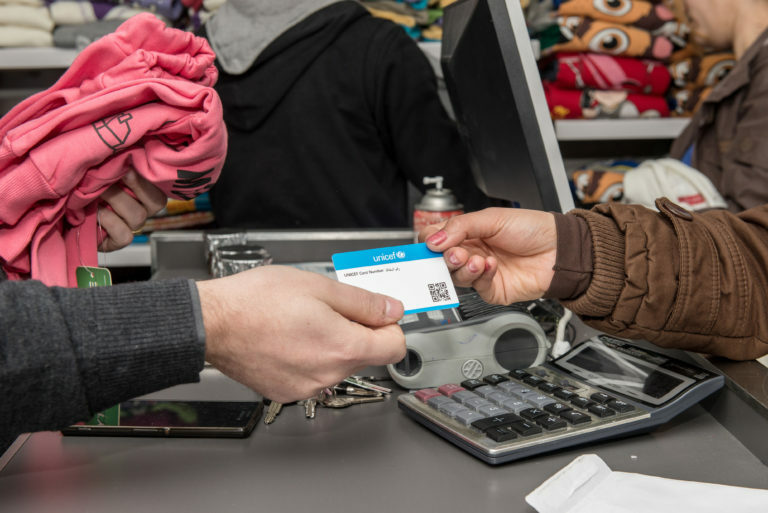 A parent uses a UNICEF provided e-voucher to purchase a full set of winter clothes for their children. 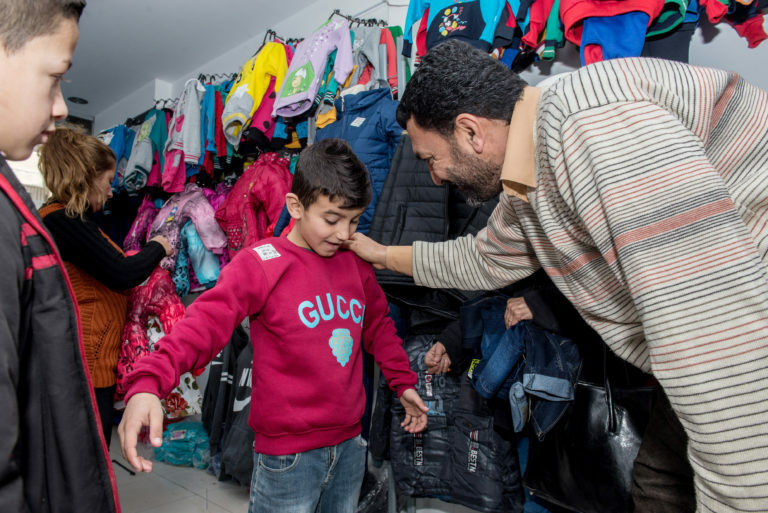 We partnered with 33 stores in Syria and provided families with e-vouchers to buy a full set of winter clothes for their children. The e-vouchers work similarly to an ATM card and provide a jacket, a woollen sweater, a thermal outfit, warm winter trousers, a woollen hat, scarf, gloves, socks and a pair of winter boots for each child. Photo: Hasen, Syria 2016. Khaled 1, smiles while trying on his new winter outfit, picked by his mother. Khaled (1) arrived to the store in Qamishli with his mother and sister to buy winter clothes using an e-voucher provided by UNICEF. Khaled’s mother told us “We received these vouchers at the right time. Winters are harsh here.” For Khaled’s mother these vouchers have provided her children with the supplies they need to keep warm this winter, but they have also empowered her to choose the style and size she would like most for them. Photo: Hasen, Syria 2016. Mohammad 4, has picked out his new clothes. As unemployment and inflation rise, families in Syria cannot afford to pay for basic supplies like winter clothes for their children. As Mohammad’s mother told us “Since my husband lost his job, it’s become increasingly difficult for us to provide for our two sons.” With vouchers provided by UNICEF her two boys received the supplies they need for winter and Mohammad (4) got to pick out his own clothes. Photo: Hasen, Syria 2016. Shahed 8, is happy to pick out his new winter clothes. Photo: Zeinah, Syria, 2017. Yousef and his father are both happy as Yousef tries on his new red jumper. “I like the colour red so I want to get all my new clothes in red,” said Yousef who came with his parents and brother to choose a new set of winter clothes using an e-voucher they received from UNICEF. Photo: Zeinah, Syria, 2017. Leen is having a difficult time deciding what to buy. The e-voucher programme is keeping children warm and safe from the cold while empowering them and their families to choose the styles and sizes they like the best. Clothing e-vouchers are providing them with a sense of dignity and contributing to the local economy.